The Covenant Congregation Partnership was developed out of Spirit in the Desert’s call by God to serve and support congregational members and leaders. Spirit in the Desert is committed to helping people renew their callings from God in their 3rd Chapter of Life … so they can lead lives of meaning and purpose. It is our hope that we can support your ministries in your congregation and provide resources at Spirit in the Desert. Each Covenant Congregation designates one or two members of the congregation to serve as Spirit in the Desert Ambassadors to help develop and nurture the relationship. Helping develop the 3rd Chapter of Life ministry at Spirit in the Desert. Some programs will be created for use in congregational settings and others will be in a retreat format at Spirit in the Desert. Printed and electronic material from Spirit in the Desert to help congregational members learn about the educational and volunteer opportunities at the Center. Lutheran Social Services of the Southwest (LSS-SW), like Spirit in the Desert Retreat Center, was founded and continues to be supported by Lutheran laypersons, clergy and congregations as well as by many others. LLS-SW was created in 1970 by a group of congregations in Phoenix that noticed needs of people in their community and saw the opportunity to respond with basic services and loving care. LSS-SW is vital hope for seniors and people with disabilities, some of whom are alone and often lonely. Care and basic services are provided to refugees who are surviving the unimaginable. Children and family services are provided to help children grow in safe and loving families. Emergency services address the immediate need of hunger and homelessness in collaboration with other community partners and resources. There is an on-going collaborative relationship between Lutheran Social Services of the Southwest and Spirit in the Desert and there is mutual support for their respective, yet similar, missions. Bob Ravenscroft is a special friend to us at Spirit in the Desert! He has served on our Board of Directors and has been a prayer and financial supporter for many years. His investment in our ministry is vital and we are honored to have our large chapel reflect his name! Music Serving the Word is a powerful ministry of music and word woven together to inspire faith and warm the soul. As we partner with them in concerts and outreach and service to their Board, we know that this partnership is making a difference in the lives of so many people. If you haven’t gone to a Ravenscroft Trio (or other musical group offerings) concert, you don’t know what you’re missing! When Spirit in the Desert was chartered, it was the Grand Canyon Synod of the ELCA that helped to make that happen, establishing us as a 501 (c) 3 non-profit organization. For 3 years Spirit and the Grand Canyon Synod have worked together to further the ministry of the Gospel to Arizona and parts of Nevada, which represents the geographical area of the Synod. Our ongoing partnership helps for educational programs for clergy and church leaders, retreats for a variety of church ministries, plus opportunities to join together and work side-by-side in our communities. It is an honor to partner with the Grand Canyon Synod! The Healing of Memories workshops for Veterans started in 2013. The Arizona Coalition for Military Families aids in building new lives for the veterans and their family, through healing programs, and other forms of support. This Coalition supports the Healing of Memories workshops and assist veterans in being able to attend. Together, we can reach more veterans in our state to offer a step of healing for them in body, mind and soul. And that step also impacts their families a well. 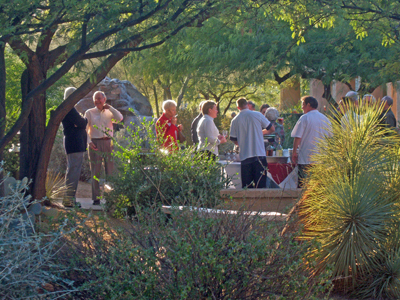 Spirit in the Desert has been a part of the Chamber of Commerce in Carefree/Cave Creek for many years. We have hosted meetings here when space is available, and being a part of the chamber helps us to know the new businesses coming into our community. We work together with the Chamber and our two small towns in making this area a better place for all. Grand Canyon Synod’s WELCA-Women of the ELCA-is another partner in ministry to the women of all the churches in the Grand Canyon Synod. From providing text and worship music, convention space, retreat space, etc., to each of the chapters of WELCA, Spirit in the Desert has been blessed by these women who have a heart to serve their churches and communities. The Knights of Columbus, Resurrection Assembly 3280, has partnered with us for 3 years now by investing in our Healing of Memories for Veterans workshops. Their support helps veterans of all ages attend this healing and life-giving workshop. Because of partners like the Knights of Columbus, all veterans can attend free of charge. We are grateful for the investment in our veterans and this healing outreach! Kiwanis International of Carefree, AZ, have invested in our local veterans and their families by financial assistance to the Healing of Memories Workshop, which reaches out to each vet with help for their PTS, trauma, and moral injury issues. Many of our local Kiwanians are veterans themselves, and eager to help another vet get back on their feet and live with purpose and values. We treasure the Kiwanis of Carefree for their care and love for our veterans! Bob & Samantha Fox founded Wild at Heart Raptor Rescue many years ago and our communities can be thankful for them. In fact, their outreach in teaching the value of raptors stems to the whole state and beyond. Their call line is open 24/7 and they will help in any way they can. They have programs in schools, churches, community centers, etc., to educate and encourage people to care for God’s creation. Spirit has had Wild at Heart on our campus for a variety of learning opportunities. As another fellow non-profit in our community, we are honored to share their story and their healing for the raptors that are so vital to our beautiful Sonoran Desert. Thanks Bob & Sam for all you do!